NEW VERSION INTRODUCES PLUG AND PLAY SUPPORT FOR iRIG PADS! DJ Rig is a full-featured DJ mixing app for iPad that lets you auto mix, tempo sync, add effects and more to the songs in your device's music library. Now you have a double-deck mixing app that lets you rock a crowd and be the life of the party anywhere. Pair it with the new iRig Pads hardware for a performance experience they wont forget! 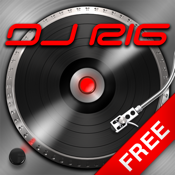 DJ Rig fills your iPad with many advanced features normally found only in professional mixing software and hardware. DJ Rig's double-deck interface comes with selectable waveform, turntable or digital jog interfaces, so no matter what type of software or hardware DJ setup you are used to you'll feel right at home. You can control DJ Rig straight from your touchscreen, but for an even better experience, try it with an IK controller. The latest version includes plug-and-play support for iRig Pads, IK's new ultra-portable groove controller. Browse the music library, cue loops, sync tracks, crossfade, adjust pitch and more straight from your iRig Pads! You can also use DJ Rig with iRing for touchless control and iRig MIX for DJ mixer control. You can even let DJ Rig automix your entire sound library so you can focus on creating accurate mash-ups and dramatic breaks. Combined with the magic of the iPad multi-touch surface, it gives DJs a whole new level of expression and creativity while on the move. The unique X-Sync feature (available when used with iRig MIX) enables anyone to automatically sync the app audio with any other external audio source like a second iOS device but also regular CD or MP3 players. - Multiple deck modes: accurate waveform display, vinyl and digital interfaces.